(From Carl Zeiss lens literature) Carl Zeiss presents the Distagon T* 2/25 ZE and ZF.2 moderate wide-angle lenses. The large image angle allows photographers to capture exciting perspectives. With its excellent imaging quality at all aperture settings, the lens flexes its muscles particularly for photo documentaries in interior rooms where space is at a premium, as well as for pictures of objects, architecture and landscapes. In many situations, a flash is an unwelcome feature — at family gatherings, in a museum or in a church for example. To capture the mood in such places, photographers gladly do without aggressive lighting and instead work with particularly high-speed lenses that enable short exposure times even under difficult lighting conditions. Lens elements meticulously crafted to minimize stray light and reflections in the lens, and the Carl Zeiss T* anti-reflective coating to increase light transmission enable high-contrast image rendition and color saturation. The previously available Distagon T* 2.8/25 ZF.2 will continue to be on stock and supplements the new Distagon T* 2/25.Therefore, this new lens is also the first 25-mm lens of Carl Zeiss for the EF-bayonet. The Distagon T* 2/25 will be available end of 2011 at a recommended retail price of €1217 (excluding VAT) which translates to about US$1700 (as of Oct 27, 2011). Sharp and contrasty at all apertures and distances. Low coma, low "bleeding", very low flare, good contrast when shooting against the light. I bought this one second hand, otherwise the quality/price ratio would become problematic as there are good alternatives on the market (e.g. 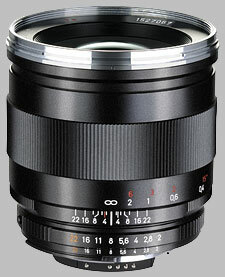 Sigma 24/1.4 A, or Nikon 24/1.8). It is an excellent fit for the Nikon Df for instance, also in terms of size and weight. This lens exhibits a very high contrast and sharpness right from the widest aperture, at all distances. Vignetting is on the high side though (about 2 IL), so it may need correction, depending on the subject. The lens unfortunately exhibits a significant field curvature, the corners of the sharpness plane being bent rearwards, even at infinite setting. You better be aware of that when shooting flat subjects. Otherwise, this lens yields images with the typical Zeiss look - high microcontrast, saturated colors. It is also a brilliant performer at night, since point light source do not give rise to any significant artefact. Manual focussing is on the firm size, a bit too stiff for my taste, but comparable with other Zeiss lenses. As usual with WA, it is difficult to focus precisely on the matte screen; depending on the subject and lighting conditions, you may want to revert to LiveView. Bokeh is unusually good for a WA lens. Needless to say, manufacturing quality is top. Image quality is consistently good, and the widest aperture is particularly attractive, at least when vignetting is not a problem. The images just pop.